Mr. Ayan Maity, PhD Student of NanoCat lab, received best Oral award (1st prize) in National Conference on “Advanced Materials for Energy and Environmental Applications (AMEEA-2018)” at National Institute of Technology (NIT), Rourkela, 12 - 14th December, 2018. 1. International Conference on Nanotechnology, ‘NANOCON’ during 25-26 October 2018 at Hotel Shereton Grand, Raja Bahadur Mill Road Pune. 2. “ACS Publications Forum: Expanding Frontiers in Chemical Science” on November 1, 2018 at Banaras Hindu University (BHU), Varanasi. Thank you for your support to Conference on Advances in Catalysis for Energy and Environment (CACEE-2018), http://www.tifr.res.in/~cacee/. We have now uploaded the CACEE-2018 videos to summarize the three-day activities at https://www.facebook.com/tifrcacee/. Please LIKE this page and write your comments and suggestions on this page. Prof. Vivek Polshettiwar is selected for Indian National Young Academy of Science (INYAS) for the term 2018-2022. Mr. Ayan Maity received Best Poster award in SasChem Symposium held at IISER, Kolkatta during 29-30th Sept. 2017, for his work on DFNS. Energy and environment are two of our critical societal challenges. Catalysts are essential for the modern society as they can resolve these critical challenges. These challenges are becoming the main concerns of the global vision of the societal challenges and world economy. Catalysis research became one of the most powerful tools to take on these challenges and the field of catalysis is undergoing an explosive development. Specially, nanocatalysis can help design catalysts with excellent activity, greater selectivity, and high stability, by tailoring their size, shape, and morphology. Nanocatalysis is no longer just a field of academic curiosity but an emerging field for industries to develop green and sustainable processes. However, next-generation catalysts (including -nano, -bio and photocatalysts) with very high turnover number, reaction rate and stability are needed to take this field to the next level. Carbon dioxide (CO2) emissions is another serious environmental concern that need to be urgently tackled to avoid potentially dangerous climate change, which may not be reversible. Capture and conversion of (CO2) to fuel and fine chemicals is one of the best ways to tackle the challenges of environment and energy together. Although various types of efficient (CO2) transformations to useful chemicals have been discovered but efficiency of these processes are still limited in terms of catalytic efficiency and stability.Hence novel catalysts systems are needed which will improve the catalytic efficiency of these processes and also be sustainable. The objective of this conference is to bring together scientists working in these area for deliberating on current and future prospect of catalysis for energy and environment. Conference will have keynote talks, invited talks, industry talks, and poster presentations. This will be the first conference in the series, and we plan to organize conferences/workshops on this theme regularly at various venues. 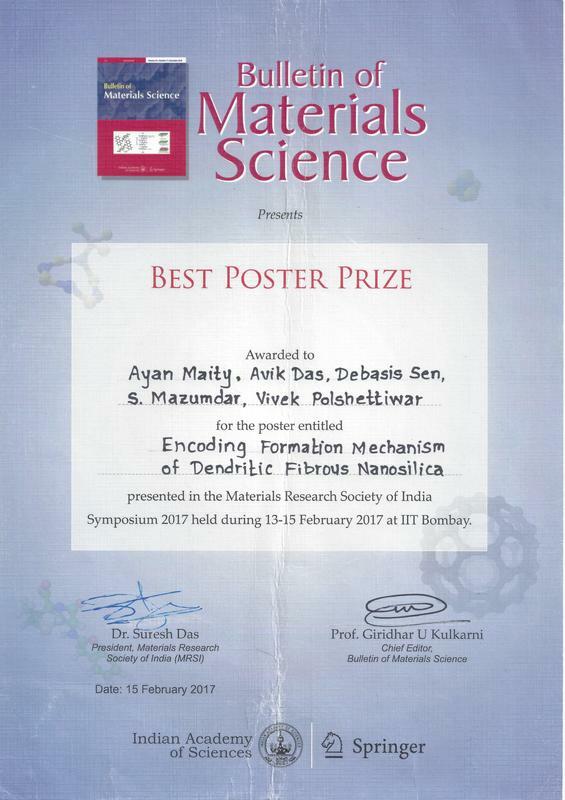 Mr. Ayan Maity received Best Poster award in MRSI Annual Symposium held at IIT, Mumbai during 13-15th Feb. 2017, for his work on formation mechanism of fibrous nanosilica (KCC-1).